The word I hate the most in the English language is hustle. I hate it not because it is, in and of itself, made up of bad tonality and terrible connotations like “moist,” but rather I hate it for what society has made it to be. It’s become a glorified a state of being that pridefully boasts a high level of busyness that’s accompanied by exhaustion—almost proclaiming that dreams and goals can’t be achieved any other way than by ending each day burnt out, too weary and blurry to return home to loved ones as an actual functioning, contributing human being after the computer screen closes at work. I have always and continue to support working hard and putting in the late hours to make magic happen and passion come together—but when that standard of busyness becomes the new normal, we transform into worshippers at the steps of a hustle idol, somehow trying to prove our worth in the number of hours we put in. It’s simply not sustainable. If no one has ever told you, hear this today—the hustle neither deserves nor needs your sacrifice. You don’t have to live overworked and unavailable, you don’t have to be absent from your one big, beautiful life, and you don’t have to work 20 hours a day at the expense of your body, heart, and soul. Instead, the best work comes when we work from a place of rest. 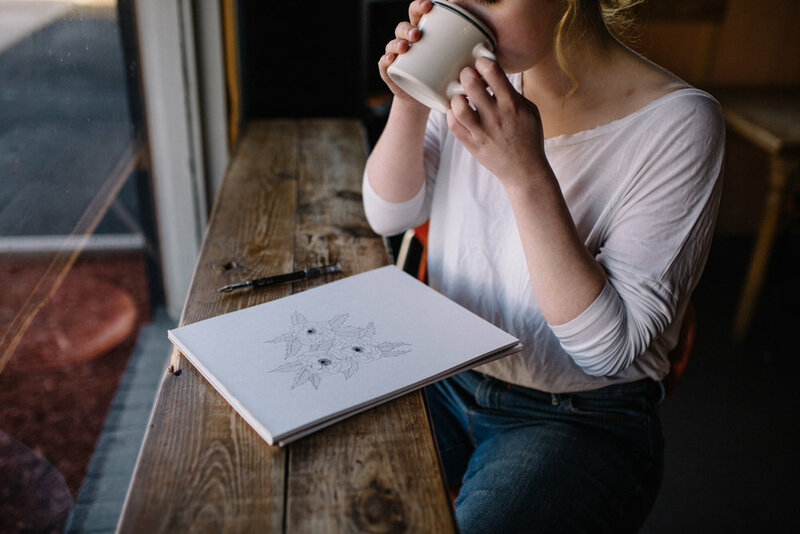 See, when we forget to rest, we spend more time filling up the second, third, fourth cup of coffee than we do putting paint on canvases, music on sheets, words on paper. Our weary bodies yawn in and out of work, wasting precious time simply trying to refocus on the task at hand. That’s what happens when we mix up our priorities. When we choose to fill our lives first with lesser things like work, we hardly have enough space left for our hobbies and interests to take center stage, much less self-care, relationships, and faith. If you’re anyone who has ever given in to the hustle—the work, work, work mindset that forgets dinner dates and dance recitals and family gatherings—you know what it’s like to go without rest. I know, I’ve been there, too. And it wasn’t just my body that suffered from insomnia, poor meal choices, stress headaches, and buzzing dizziness. . . my relationships suffered too. Friendships slipped away, family was forgotten, and conversations with my husband became a novelty. That’s what happens when we let hustle take priority in our days; we do so at the cost of edging out and forgetting to invest in the most precious gifts we have. So when a writer that I admire and respect started talking about working from a place of rest rather than hustle, my ears perked up. I’d read a little into the slow living and slow writing movements and I thought the idea of hygge sounded peaceful. But I thought I was too busy for such luxuries in my own life. Work from a place of rest, not hustle. But that day, I finally saw clearly a terrifying reality: for years, I knowingly and willingly let hustle hijack my life. Every single day I was getting up in the morning, phone already in hand (emails ticking by, Instagram Stories on repeat) while my husband waited patiently for me at the kitchen table with a morning cup of coffee. I was tipping the priorities scale in a widely uneven way before my body even had time to shake off the sleep. See when we work from a place of rest, we not only benefit from healthier lives, but the people around us benefit from a fully-functioning human being. Our friends get their girlfriend back, our husbands get their wives back, our families get their mothers, daughters, and sisters back. And our jobs and passion projects get our fully brilliant, fully wide-awake selves back. So now, I try to stop looking at emails after dinner. (I’m still a work in progress.) I put my phone away when I walk into the bedroom. I brush my teeth next to my husband rather than next to my Twitter feed. I read in bed rather than scrolling through Instagram. And in the mornings, I leave my phone away while I wash my face and clothe my body, listening to the soft sounds around me, preparing my heart for the day. In the process, I’ve found my soul to be quieter, less restless, less full of meaningless noise. And each day that I choose my husband, my friends, my family, my faith over the hustle, my soul becomes a little more aware of the beautiful world around me, a little more thankful for everything and everyone that I already have. Work from a place of rest, not hustle. Start today. Realign your priorities and actively choose rest. It truly is the only way we were meant to function.